Chris Pratt is here to hype up Jurassic World 3. After being extinct for a decade and a half, the Jurassic Park franchise was reinvigorated with the release of Jurassic World in 2015. 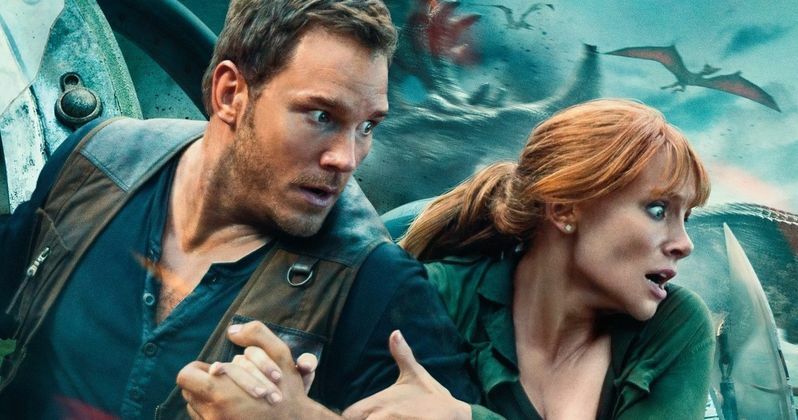 That movie and last year's sequel, Jurassic World: Fallen Kingdom, were both tremendously successful (at least financially speaking) and, as such, we're getting a third installment. According to Pratt, we won't be disappointed. The former Parks and Recreation star was recently making the rounds to promote The LEGO Movie 2: The Second Part. When asked about the upcoming installment of the dino-centric franchise, Chris Pratt initially joked that they're going to have it be like in The Flintstones, with cars operated by feet and work whistles made out of birds, before actually digging in. Here's what Pratt had to say about it. "I can't say anything, but I can tell you when I heard the pitch, I was blown away. I can't believe that we're going to make that movie, and I can't believe they found a way to deliver on the promise of the end of Jurassic World: Fallen Kingdom. Like, 'Wait what? The island has blown up. The animals are out, we can't put them back in the box. What are we going to do? How are not only these dinosaurs but this technology moving forward going to affect the planet?' We jump forward, and it's like, 'Oh! Oh, right! Oh, damn!' He's [Colin Trevorrow] been working his but off on it. it's going to be pretty epic." Colin Trevorrow co-wrote and executive produced Fallen Kingdom after directing the first movie, with J.A. Bayona taking over directing duties. The fifth entry in the long-running series grossed $1.3 billion worldwide, despite a largely negative critical response. Trevorrow has been tapped to step back into the director's chair for this third movie. Unfortunately, even though the end of Fallen Kingdom set up what would essentially be Planet of the Apes with dinosaurs, Trevorrow has already said it won't be dinosaurs attacking cities. Bummer. But can we maybe expect to see Laura Dern and perhaps even Sam Neill return as Ellie Sattler and Alan Grant alongside Jeff Goldblum's Ian Malcolm? Goldblum returned, albeit briefly, in the previous movie. Chris Pratt played coy, but had this to offer. "I just saw Laura [Dern] too the other day and we discussed this a little bit, some of this stuff. You will not be disappointed." Laura Dern has already expressed her desire to return and Jeff Goldblum is also game. As for the story? Colin Trevorrow is working on the script with Emily Carmichael (Pacific Rim: Uprising). So, even though it won't be as off-the-rails chaotic as some may have hoped, Chris Pratt seems confident audiences will be satisfied. Jurassic World 3 is set to hit theaters on June 11, 2021. Feel free to check out the full interview with Pratt from the MTV News YouTube channel below. Related: What's Happening in the Jurassic World 2 Post-Credit Scene? Will Jurassic World 3 Take Dinosaurs Into Space? Jurassic World 2 Ending Explained, What It Means for Jurassic World 3?